The potency of the mantra is accentuated according to the degree of concentration held while chanting. Sandstone sculptures have been found in India, dating from 185 BCE, which show Yogic sages holding prayer beads. Scholars believe that the practice of using mala beads originates in the 8th century BCE. Over two-thirds of the world’s population use prayer beads as part of their spiritual practice. Prayer beads are known as malas in Asia, subha in the Middle East, and rosaries in the West. The circular shape of a mala and the physical connection between its beads serves as a reminder of the interconnectedness of life and the cyclical nature of spiritual lessons. Rudraksha seeds have a natural hole in their center which made them a natural bead to be used in a mala. The first malas ever made were most likely strung from rudraksha seeds. Mala is a Sanskrit word meaning garland or wreath. 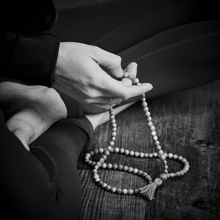 In the yogic tradition, malas are made with 108 counting beads or a division of 108, with 27 and 54 being the most common. The earliest known use of prayer beads is the yogis and Hindus use of mala beads. Prayer beads are used in many different religions including Buddhism, Islam, Christianity and Sikhism. When chanting with your mala, it is best to concentrate your awareness either on the lotus of the heart or the space between the eyebrows. 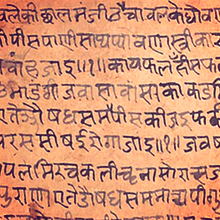 Traditionally mantras are received orally from a teacher or Guru and kept in strictest secrecy, but now there are many open mantras available for one to use. The Yoga-Yajnavalkya says that a whispered mantra is a thousand times more beneficial than a spoken one, a mental mantra is a thousand times more beneficial than a whispered one, and meditating on a mantra is a thousand times more beneficial than its silent recitation.